(Phys.org)—Calling it an "Ode to Bubbles," MIT researchers have produced bubbling in sync with Beethoven's Symphony No. 9: Ode to Joy on a surface resembling a piano keyboard. 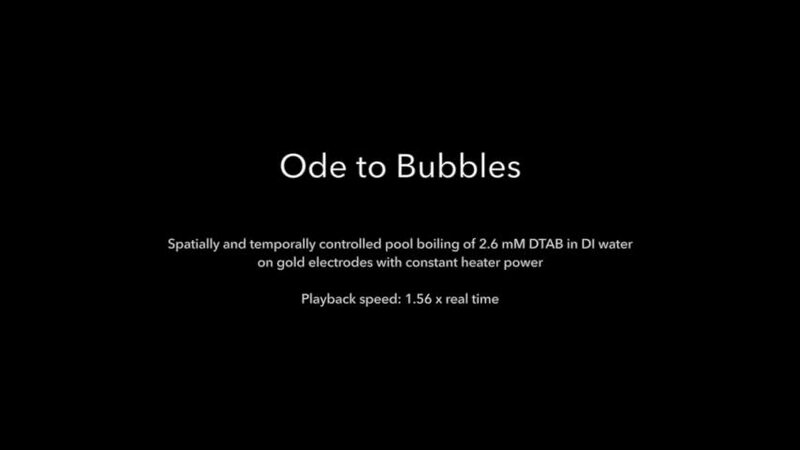 The performance demonstrates the researchers' new method of turning bubbles on and off on different areas of a boiling surface in a fraction of a second. The researchers, H. Jeremy Cho, Jordan P. Mizerak, and Evelyn N. Wang from the Department of Mechanical Engineering at MIT, have published a paper on the method to control boiling on demand in a recent issue of Nature Communications. Although the bubbling piano is an entertaining way to illustrate controlled bubble formation, bubble nucleation also has important industrial applications. Many heating, cooling, and electricity generation systems rely on boiling water, and controlling bubble formation in these systems could improve their performance. "I believe that the ability to dynamically and spatially control bubbles—hence heat transfer behavior—can offer a manipulation capability that has not been achievable before," Wang told Phys.org. "This could lead to a more efficient operation of boilers, power plants, and thermal management devices, among many others." One intriguing aspect of the new method is that it controls bubbling without changing the heat input, as cooks do when boiling water on a stove. Instead, the researchers added a small amount of charged particles to a container of water at its boiling point. They then applied a weak voltage (-2 V) using a counterelectrode immersed in the hot water. The voltage promotes bubble nucleation if the particles are positively charged and suppresses bubble nucleation if the particles are negatively charged. The reason why this technique works can be traced to the chemical structure of the charged particles. These particles contain long carbon (alkane-like) tails that repel water. When the particles move to the silver foil surface at the bottom of the boiling container, they make the surface more hydrophobic, somewhat like an oil. This hydrophobic surface makes it easier for bubbles to form because it increases the contact angle between the bubbles and the surface, which in turn changes the bubble's shape. A bubble that would have been very spherical in plain water becomes more hemispherical on the hydrophobic surface, and a hemisphere is more energetically favorable to nucleate than a sphere. Adding a voltage enhances the bubble control by moving more or fewer particles to the silver foil surface. The negative voltage attracts the positively charged particles, pulling more of them to the silver foil surface to make it more hydrophobic and increase bubbling. If the particles are negatively charged, then they are repelled by the negative voltage and move further away from the silver foil surface, which decreases bubbling. Tests showed that application of the voltage could reversibly increase the heat transfer performance of the water by 1000% and change the temperature by about 2 °C. 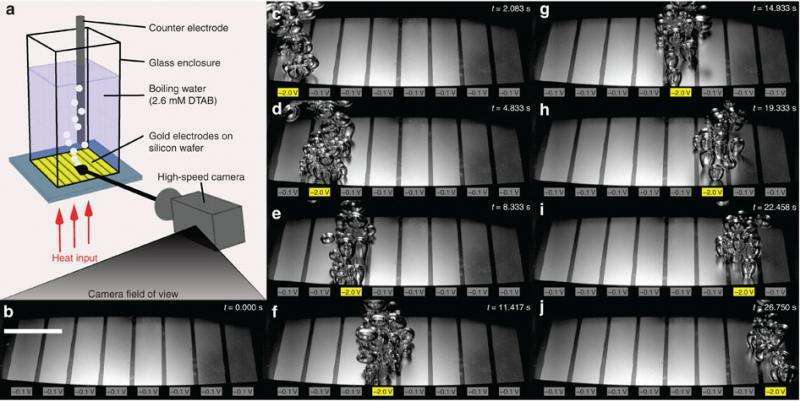 By building a boiling surface with eight separately addressable electrodes insulated from each other (which represent the eight "piano keys" in the video), the researchers could also achieve spatial control of boiling on the scale of a few millimeters, selectively activating bubbles in precise locations with sub-second precision. Bubbles and boiling have numerous industrial applications, including in power plants, solar and wind energy applications, and computer chip cooling. All of these applications experience varying conditions, and controlling boiling by controlling bubble nucleation offers a way to optimize the performance of these applications even as conditions vary. The researchers explained that boiling water is an ideal way to move lots of energy because it can store a large amount of energy in a small temperature difference. However, getting the most out of boiling is tricky because more bubbles are desired in order to move as much as energy as possible, but too many bubbles can cause an insulating vapor film to develop, which can cause a catastrophic rise in temperature. The standard approach to this tradeoff is to engineer an expensive surface that generates a lot of bubbles and prevents a vapor film, but this one-size-fits-all approach isn't the best for both areas. "What we've done is create something that could switch and optimize boiling behavior depending on how you would need it, using only plain surfaces and common detergents," Cho said. "It's the flexibility of operation with our approach that might offer a new perspective on how we can best utilize the very useful liquid-vapor phase change process." Cho also explained that the new method could be used to enable conventional power plants to respond to intermittent renewable energy sources such as solar and wind in order to meet demand. "There are things called peaker plants, which are power plants designed to turn on and off very quickly to provide power during peak demand," he said. "Inside these plants, operation is much more transient, and hence things like flow boiling is going to be much more variable. Being able to control bubble nucleation is an extra knob to turn to optimize and improve the overall efficiency of these power plants, whatever the transient condition may be." In electronics, the technique could be used for cooling "hot spots" on computer chips, which are areas of concentrated heat generation. Having boiling occur only on those hot spots during the times that they heat up significantly would lead to more uniform temperatures and better chip reliability. "Imagine you're composing a few emails on your computer and not using very much CPU power," Cho said. "To keep your computer as cool as possible, you might want to maximize bubble nucleation, which you can afford to do since the overall heat generation rate is low. However, if you decide to play a game or edit some video, then your CPU would be generating a lot more heat, so you might not want to maximize bubble nucleation in order to prevent film boiling. While we haven't seen the need for boiling in chip cooling yet (there are some limited two-phase systems like heat pipes), it may happen in the future if heat densities continue to rise as they have been." Other areas include using tiny bubbles to thermally actuate pumps, valves, and mixers in microfluidic devices for lab-on-a-chip applications and other microscale devices. Besides these applications, the researchers are also keeping an open mind for even more innovative uses of boiling. "As much thought as we have put into this, there could be many other applications we just haven't thought of because we're just not used to thinking of heat transfer in this way," Cho said. "We've always thought of boiling analogous to an electrical resistor (we talk about any heat transfer as having a thermal resistance). But by being able to alter nucleation via voltage, we've made a thermal transistor of sorts. Obviously, the electrical transistor had a huge impact on technology, so we are curious what an evolution of heat transfer could bring."